Do your laundry conveniently in the Godrej WF EON 600 PAE 6 kg Fully Automatic Front Loading Washing Machine.You can easily remove germs and tough stains from clothes by using its user-friendly features. This washing machine sports a front loading design to load and unload clothes conveniently. 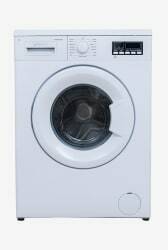 Thanks to its high-quality construction, this 6 kg washing machine offers improved durability.